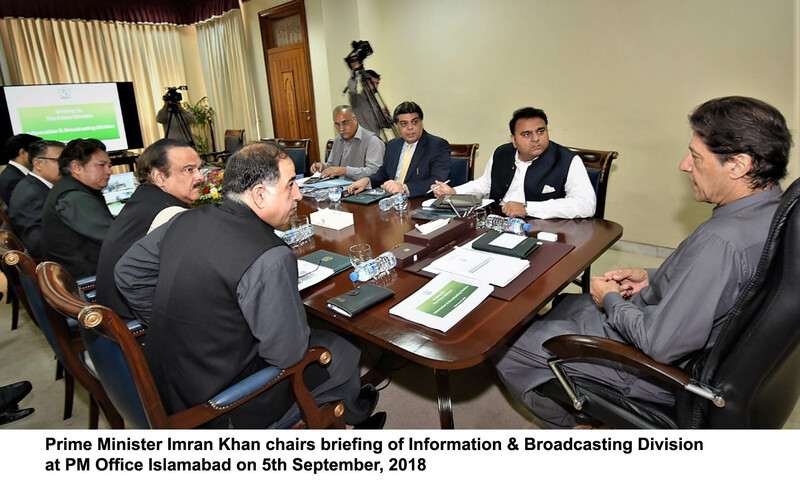 ISLAMABAD:(APS) Prime Minister Imran Khan chaired a briefing on Ministry of Information & Broadcasting at PM Office on Wednesday. Minister for Information Chaudhry Fawad Hussain, SAPM Mr. Iftikhar Durrani, SAPM Mr. Naeem-ul-Haq, Secretary to the Prime Minister Mr. Muhammad Azam Khan, Secretary Information/MD PTVC Sardar Ahmed Nawaz Sukhera and senior government officials were present during the meeting. Secretary Information gave a comprehensive presentation regarding the role of the Ministry and its various attached department. The Prime Minister stated that Ministry of Information has a key role in perception management and projecting true image of the country. While keeping with the pace with highly sophisticated world of information today, we must safeguard our society from cultural onslaught that endangered our cultural values, norms and the social fabric, observed the Prime Minister. Discussing the affairs of state media broadcasters including Pakistan Television Corporation and Pakistan Broadcasting Corporation, the Prime Minister stressed on maintaining impartiality and directed to constitute a board of directors, comprising of eminent persons of known integrity and professionalism, to oversee administrative and financial affairs of these departments. Prime Minister Imran Khan directed for a comprehensive plan with delineated timelines for restructuring of PTV in order to transform the organization from a loss making entity to a viable organization.